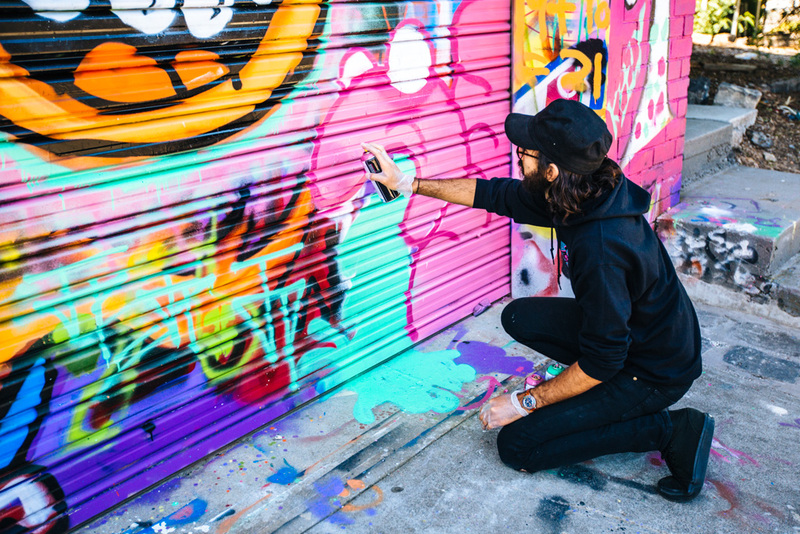 Filed under Surprising/Shocking/Unlikely/Absurd Things That Exist in Melbourne (of which there are MANY, god bless this city): a hands-on street art class! I had no idea this was a thing until App Guy gifted me with a voucher for Christmas. 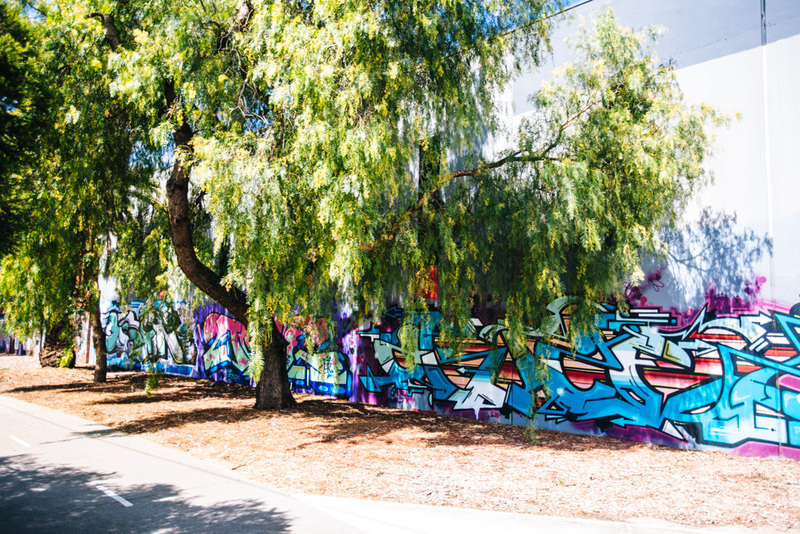 The Footscray Community Arts Centre is a virtually unknown treasure trove of affordable creative classes offered to the Melbourne community. They have a Can Control class for kids that regularly fills up, but only recently did they start offering a similar class for adults. 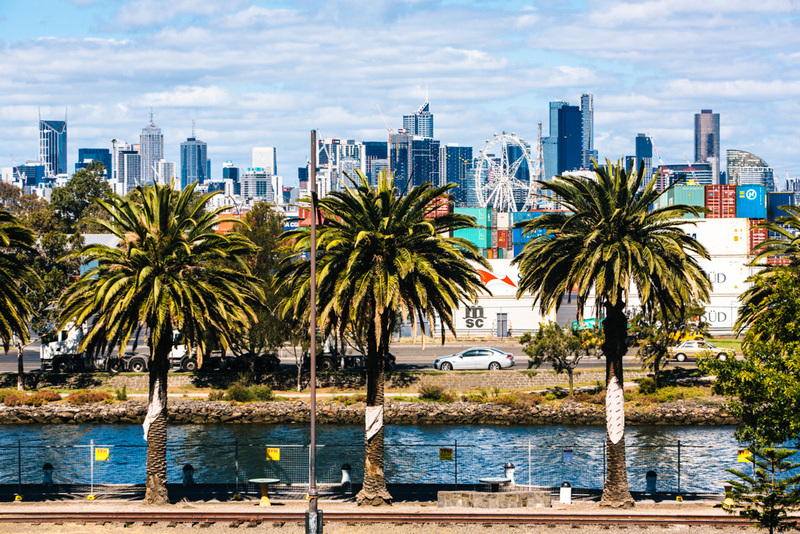 I’d actually been meaning to explore Footscray anyway, The view from the Arts Centre is meant to be one of the best in Melbourne, facing the Marybyrnong River and city skyline. And there’s a cafe nearby called Rudimentary that’s housed in some old shipping containers, which had been on my Coffee To Try list. So really, the stage was set for a thoroughly awesome Footscray excursion. View from Footscray Community Arts Centre. The FCAC’s Can Control class is split into two 4-hour sessions across two consecutive Saturdays. I was thinking that seemed like an awful long time to spend in an art class, but it wound up being pretty ideal. On Day 1, our teacher – a local street artist who goes by the name Short (real name Antonia) – took us on a tour of the neighborhood and provided some commentary on the various street art pieces we passed by. 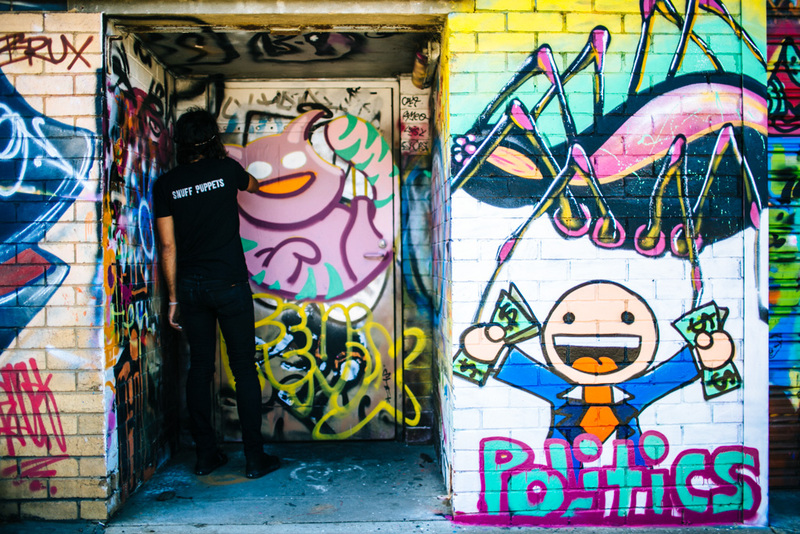 I’ve done countless of my own street art crawls, but it was so good to have it accompanied by some insight into how Melbourne’s street art culture works. We learned that it’s a very male-dominated culture, with guys and girls being part of separate ‘crews’, and girls having to fight to earn respect on the walls. If you haven’t earned it, expect your street art to get tagged and painted over. I found it fascinating to learn about some of the better-known street artists in town: how some of them are straight-up asshats, how a few have risen to fame and made a living off of their street art, how to spot their pieces around the city (some of them have pretty defining styles or tags). 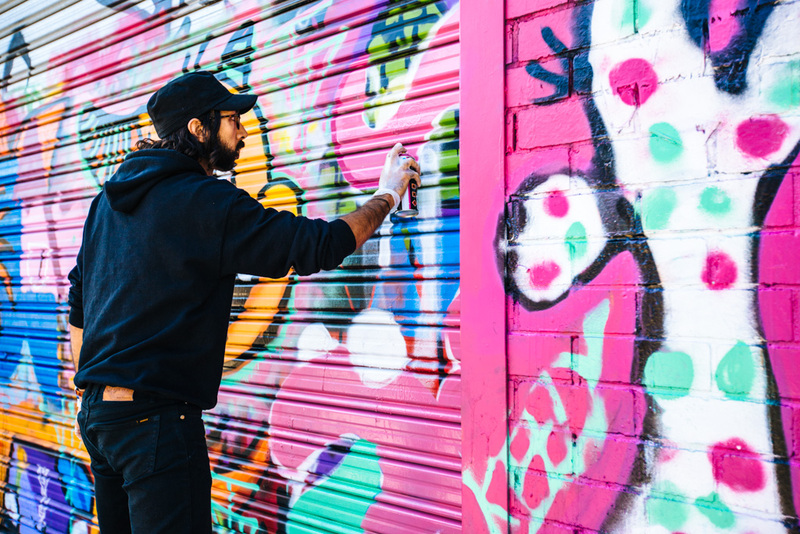 I didn’t realize that street art had such a distinct community – you’d never even know about it unless you or someone you knew was a part of it. Before this class, I really only thought about the art I spotted on city streets – not so much about the people or politics behind it. We also learned about different types of street art. 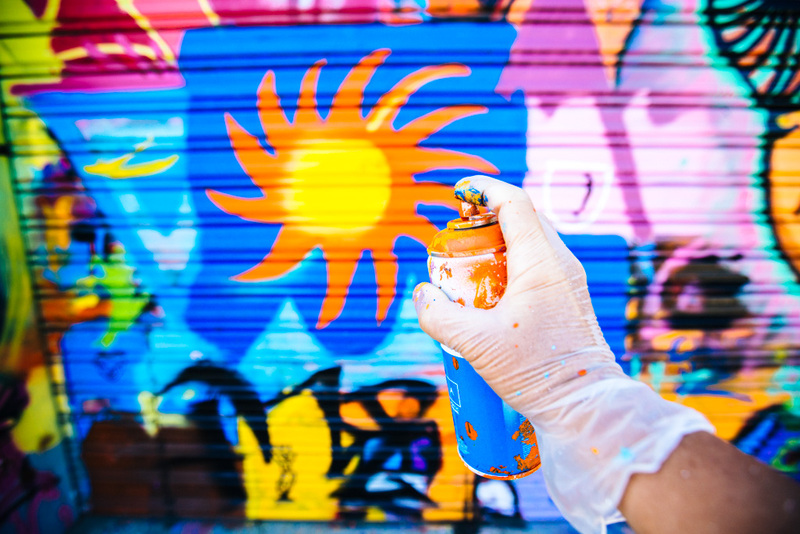 The simple tags (or signatures) are used to sign a piece or deface someone else’s work, and it’s ideal if you can connect all the letters without having to lift the can (kind of like writing in cursive). 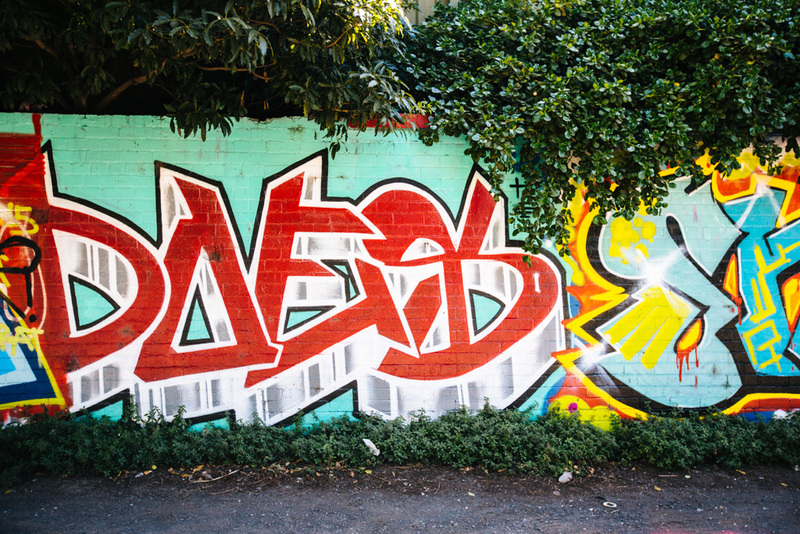 Throw-ups are those larger pieces that tend to be big boxed letters spelling out an artist’s name. I always thought they were kind of ugly and effortless, but Short explained that it actually takes a long time to master them and, if done well, can be impressive works of art. After our little street art frolic, we went inside and browsed some street art magazines for inspiration. Short shared her portfolio with us and I got all excited when I recognized one of her pieces from around the city. She’s been doing this for 5 years now, which is damn impressive considering how difficult it is for women to break into this male-dominated community. We popped back outside to start playing with the cans, first learning about the different ‘nibs’ (or tips) that fit atop the cans. Some nibs give you a finer, more precise line, while others spray more thick. I didn’t quite understand which nibs to use when, but since we were just messing around to get a feel for them I randomly grabbed one and got to spraying. My pathetic first attempt at street art. Um, guys? Street art is NOT easy. In fact, it’s way more difficult than you probably think. Not that I thought I could pick up a can for the first time and brand myself the Picasso of street art, but surely I figured my first piece wouldn’t look like the work of a 5 year old. Apparently others didn’t struggle with it as much as I did. I was all sorts of mesmerized by my fellow classmate slash street art prodigy’s first piece. I love how he didn’t restrict himself to just the one wall, but instead let his art expand onto the ground and the side panel. While I ended Day 1 feeling largely like a big fat failure, I took with me a strategy to carry into Day 2: Start out with an idea or concept of what you want to create (preferably a sketch), but let the art flow out of you however it may when it comes time to take the can to the wall. In other words, the opposite of what I did on Day 1, where I had no idea what I wanted to make and felt almost paralyzed by my wall space. On Day 2, Short encouraged us to come with photos of street art pieces we might want to emulate, and we kicked off the day by sketching. Lord knows I’ve got an enormous collection of street art photos to call on, but I got so overwhelmed looking at them and thought for sure they all looked way too intricate for me to do any sort of justice to. I felt so helpless! But then once we established our mutual love for cats, she declared we’d be working on a collaborative cat mural outside. I know art is supposed to more free form, but as a beginner it really helped to have a clear focus, even if it was given to me. Cats! I know cats! I can draw a kitty face, sure. I nearly painted the heart-eyed cat emoji! Drawing a stupid-simple cat face is easy enough, but translating that into a colorful mural was absolutely daunting. Maybe it’s just me, but I need to feel comfortable with a skill before I’m ready to apply it. Otherwise I’m hyperfocused on the mechanics and can’t get into the creative flow. You gotta crawl before you walk, right? But okay, I only had 3 hours to create my portion of the cat mural – I didn’t have the luxury of mastering can control before applying it to street art. So I took my sweet time painting my kitty, baby step by baby step. The outline was pretty easy since I had my sketch, but when it came time to paint the cat’s facial features I froze. How should I know what looks good? I started out with a basic set of eyes, then grew them out to be rather large. 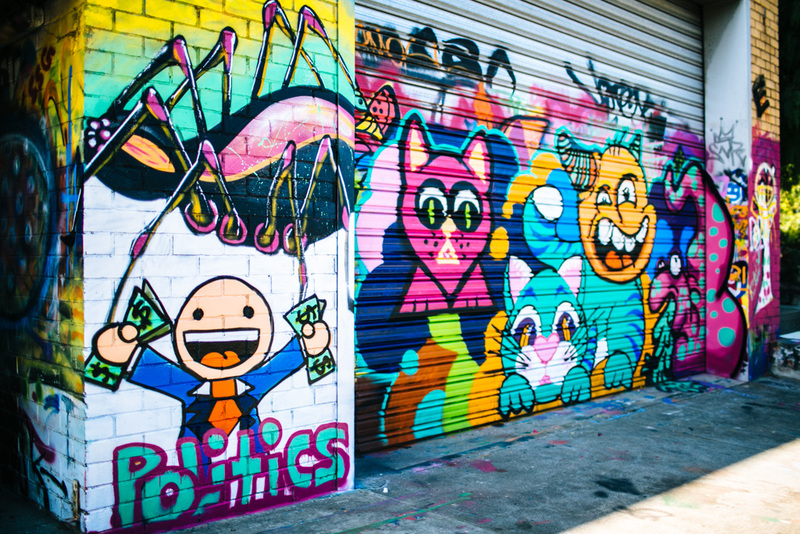 That’s the thing with street art (and art in general): it doesn’t have to be perfect or exact the first time. You try one thing, it doesn’t quite work, so you try something else. Thinking about the whole thing as a process rather than a singular task helped me work through it. It’s not an act of translating sketch to mural – it’s more like translating an idea from mental to physical. There’s no one right way to do it. My first real piece of street art! 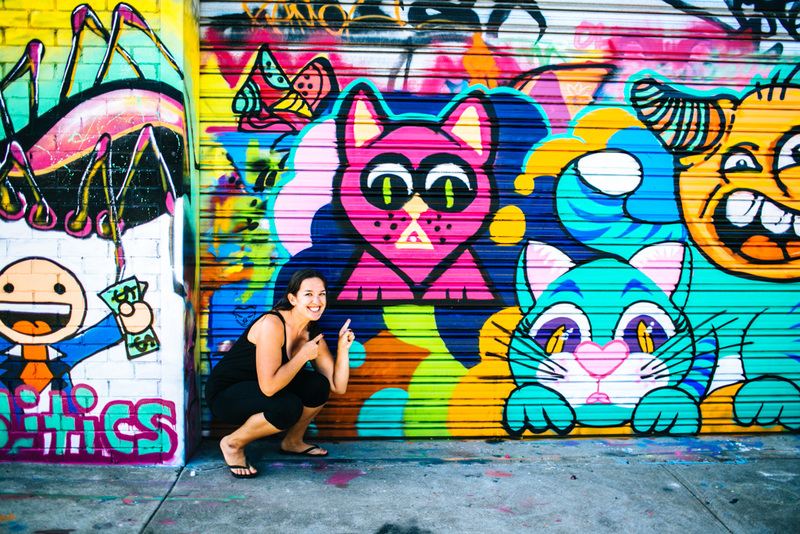 I was SO, SO HAPPY with how my street art kitty turned out. I can’t believe how much I improved after the first class! I didn’t have time to work on shadows or my tag, but I did practice cutbacks plenty: that’s where you go back and forth between adjacent colors, painting over the other color if it mistakenly went on the color you’re using, and vice versa until you have clear lines or sections of color. If there were a Day 3 to the class, I’d want to work on producing lines of different thicknesses. I know it’s affected by which nib you use, the pressure you apply to it, and the angle at which you spray, but I have zero idea how. That’s why my cat has no whiskers – because I knew I’d mess up the skinny lines, ruin the piece, and not have time to fix it! Ah well. Our finished collaborative mural! 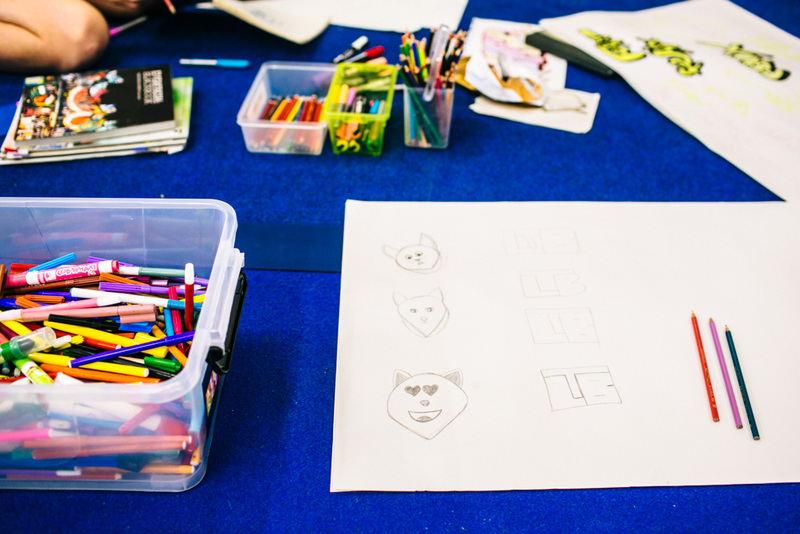 Teacher did the blue cat and spider; other student did politics, orange face, and vom-blob. Overall, I had a total blast at my Melbourne street art class. It was such a fun, offbeat activity, and I’d recommend it to anyone who enjoys street art or likes to paint. 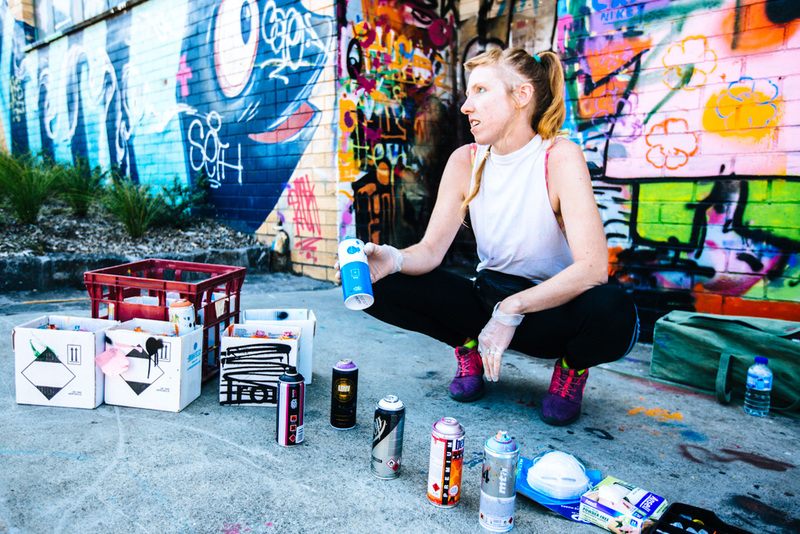 The Can Control workshop for adults at Footscray Community Arts Centre runs for two 4-hour sessions over consecutive Saturdays and costs AU$115 (US$88) – incredible value for money, in my opinion. They don’t currently have any future Can Control workshops scheduled at the time this post was published.